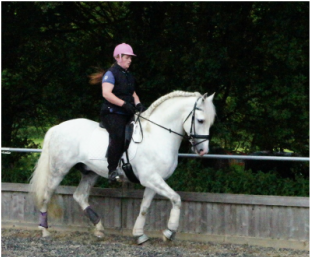 What is Classical Riding/Training and why should you practise it? As a rider and trainer I have always promoted that we should be at one when we ride or work our horse, it should not be a struggle to 'keep' our horse together, as a rider you should not get off your horse and be aching in your back, shoulders or even your hands! What ever type of work you want to do from the happy hacker to Grand Prix competition with your horse/pony the principles are the same - it should be Classical. In other words lightness, self carriage, balance and freedom of movement for the horse. For the rider there is also balance, harmony with the horse and an allowing hand that follows. It should not look like a tug of war nor should it feel like one. Both horse and rider should trust and respect each other. Even working on the ground there are so many styles that you make a choice how you want to work your horse/pony - I work with what I call Classical Liberty, my horses/ponies learn to lunge correctly using side-reins, they learning long reining, they learn words through voice training. They work at liberty once I have them on cue with lunging and on the voice aid. There is a whole world of fun you can have either riding, working on the ground or liberty it about a partnership. Vanessa Johnson with her PRE stallion Theno. Stress free training from the ground to ridden. A variety of lessons are available at home or away for clubs/groups or individuals. ﻿You could be a competition rider who would like to move on with training, or you may have hit a wall and need a different pair of eyes. You could be a pleasure rider who would simply like a safe, confident, forward thinking horse who listens when they are asked to move sideways from the leg when you are opening a gate! Lessons are not all about being a competition rider - I work with riders of all ages and abilities the important thing is that you want to learn and be open to maybe trying something different in the way you normally do it. 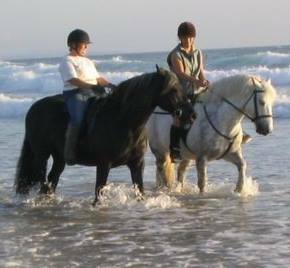 *Your lessons are tailor made to meet your requirements for your own goals, ambitions and your horses ability.